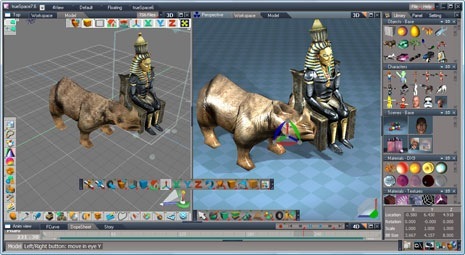 trueSpace is a 3D modeling and animation software for Windows that lets you create realistic 3D scenes from scratch, walk-throughs, games, etc. You can also import characters created in other software like AutoCAD, 3ds Max, Adobe Illustrator, etc. trueSpace used to sell for $600 but then Microsoft acquired the company and released trueSpace as a free download probably in response to SketchUp that’s owned by Google. The idea is to let users create building and landscapes for Virtual Earth just like one can use SketchUp to create 3D models for Google Earth (SketchUp review). If you are from the education community, you’ll especially love trueSpace for simulations. Like with any other 3D authoring software, there’s a steep learning curve involved with trueSpace but if you are looking for a good alternative to 3DS Max or Blender, Microsoft trueSpace is available at a price that may be hard to beat.